A very interesting group and an opportunity to again cross cues with Yakov Shaashua from Israel, having been beaten 3-2 by him in last years group stage despite taking a 2-0 lead then. As his compatriot Doran advised at the time, remember the story of the tortoise and the hare! This years event promises to be as competitive as ever. A quick review of the Snooker Breaks in last years event shows that the player who consistently scores with 50+ breaks will be a hard man to catch. 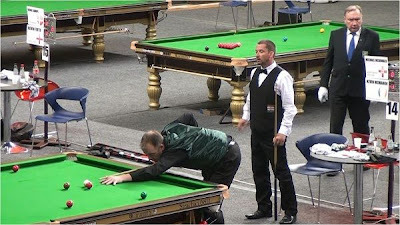 The eventual winner Steve Judd (England) managed a total of 9 breaks over 50 on his way to the title,with beaten finalist Alan Trigg (Ukraine) hitting an impressive 11 breaks over 50 points each. Nice snooker. As far as my own game goes, I managed to get in some practice time today, an enjoyable couple of hours at the Pot Black Snooker Club, in Cookstown. The Pot Black is the longest established Snooker Club in Cookstown and it was good to catch up with Ivan, who hasn't aged a day. The practice went well, I will be using my late Uncle Harry's snooker cue at the event this year, so it was good to get some time on the baize with it. The only other piece of business to complete before the flight on Sunday evening is the drive to Dublin, to pick up my new passport. Odds are that the old one will turn up before then.